If emergency treatment is not needed, bleeding can usually be stopped by applying steady, direct pressure and elevating the wound. The following steps will protect the skin wound and protect you from exposure to another person's blood. 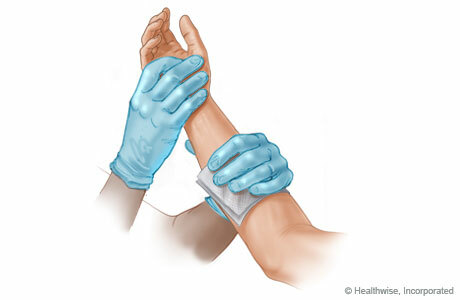 Put on medical gloves, if available, before applying direct pressure to the wound. If gloves are not available, use many layers of clean cloth, plastic bags, or the cleanest material available between your hands and the wound. Have the injured person hold direct pressure on the wound, if possible, and elevate the injured area. Use your bare hands to apply direct pressure only as a last resort. Remove or cut clothing from around the wound. Remove any jewellery from the general area of the wound so if the area swells, the jewellery will not affect blood flow. Apply steady, direct pressure and elevate the area for a full 15 minutes. Use a clock-15 minutes can seem like a long time. Resist the urge to peek after a few minutes to see whether bleeding has stopped. If blood soaks through the cloth, apply another one without lifting the first. If there is an object in the wound, apply pressure around the object, not directly over it. Occasionally a puncture wound causes bleeding underneath the skin, but only a small amount of blood comes out of the wound. When this happens, the area around the puncture wound may become swollen and bruised. If the bleeding causes blood to collect in the wound site (wound hematoma), the risk of an infection increases. Feeling very dizzy or light-headed, like the person may pass out. For more information, see the topic Shock.